Reinventing Internal Communications to Drive Behavior Change and a Strategic & Brand-Centric Culture. Learn practical strategies and step-by-step processes to help you drive change and a brand-centric culture linked with strategic goals via planning, intranets, internal social media, ambassador programs, etc. Speakers including myself and those from Cisco, USAA, Vancouver Coastal Health, and more. The Intranet Global Forum 2014 provides intranet executives and managers in communications, IT and HR with all the tools they need to understand the recent changes, and the fundamental skills for designing, deploying and governing a new era intranet. 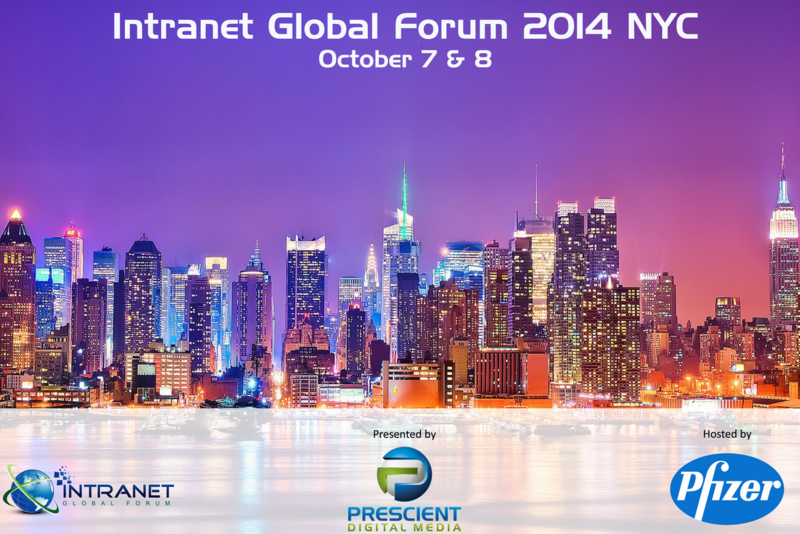 The Intranet Global Forum is ideal for executives and managers that are involved in a new intranet launch, redesign, or technology shift, and for those that manage technical, business and content components of a corporate intranet or portal. Case study speakers include those from BT, Cisco, IBM, Pfizer, Unisys, and more. Get ideas on how to communicate, share knowledge and create value with your intranet, SharePoint or enterprise search. We have sessions for the entire intranet team!